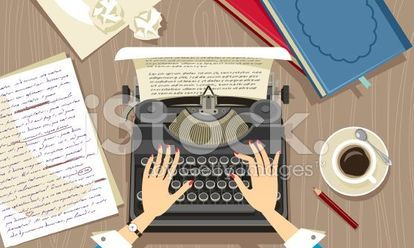 Welcome to my website where I would like to share with you some of my writing. If variety is the spice of life then you'll find it amongst my blog posts which range from the soft and fluffy to the dark and deep. Read on to learn that there's something for everyone on this page. Please also skip over to the next page where you can find out more about my books which are all available on Amazon. If you enjoy what you see, please share and help spread the word about my work. Thank you for visiting me and I hope you'll stop by again. You can also find me on Twitter, Face book and Goodreads. Reviews are an Indie Author’s best friend! But trying to get them is a different matter altogether. 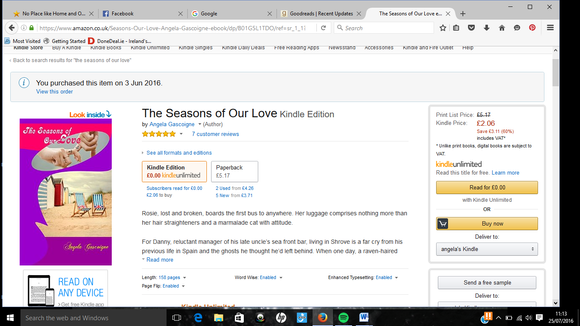 In June 2016 I celebrated the release of my latest book, The Seasons of our Love, with a free book promotion. I was delighted when over 260 free copies of my book were downloaded. I waited… and waited… and watched the tumble weed roll by. Out of all those free copies of my book, I gained only five reviews! To say it was a huge disappointment would be an understatement. I am ever grateful to the people who have taken the time to read, rate and review all of my books including The Seasons of Our Love. Every little bit of positive feedback and every review is so important and crucial to me, and this is what keeps me wanting to write. I just wanted to share one such piece of wonderful feedback I received recently by email regarding, Branded, my soon to be released follow-up book to The Seasons of Our Love. Thank you so much for you kind words Mrs Dale of Newcastle! Please check out The Seasons of Our Love on Amazon.co.uk where you can read reviews. You can find more rating and reviews on Amazon.com and on my Goodreads author page. Hope to see you there! Will it be a good one today? And a life free from shackles. I melt into him – my soulmate, my one and only true love. as a cool breeze whispers in the trees and grasses sway. Energy crackles like an electrical charge all around. The full moon seems to beckon me as I cling to him. yet, so beautiful to my touch – so solid, so permanent. Enveloped in a sparkling mist, his form appears before me. His beauty abounds and I am eager for his touch. as heat surges from my extremities to my inner core. clinging with devotion to the tombstone of this man. we are united in the flesh of our once earthly state. Hand in hand we are illuminated, bathed in moonlight. punctuated by a multitude of orange lanterns. Golden tendrils whip my face and… I am free! Alive! 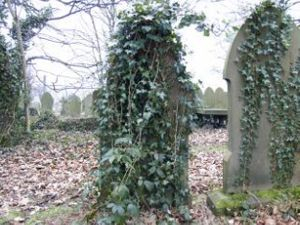 where, so long ago, we both met our end. His kiss tastes of a tender passion only tragic lovers could know. and daylight breaking through the trees. I gaze longingly into sapphire eyes for one more moment. His finger brushes my tears away, and it is time to go. Together we are cast back into our watery grave. The thunder of the raging torrent carries us back to our resting place. Late autumn sunshine shimmers on my glossy leaves. The grass is shrouded in a blanket of light frost. until next year when we will be reunited once again. Mary pulled the net curtain aside and smiled as the red car sped into the cul-de-sac and came to a stop outside her bungalow. Tentatively she stroked a gnarled finger over the black and white baby photograph on the windowsill. A bitter-sweet mix of emotions washed over her. As he climbed out, the glint from the early-evening sunshine on the pristine paint work made him squint. The car bleeped and the lights flashed momentarily. Brian checked his watch, smoothed down the creases in his suit and gave a little wave, his face taught. Mary swallowed down the lump in her throat and blinked rapidly before releasing the latch on the door. “So, what’s the emergency?” Brian asked, his eyes flitting from her walking frame to the overturned corner of the rug. He bent down to straighten it before checking his watch again. “No. Anyway, I’m perfectly comfortable. I hope you’re not coming down with something,” Mary said, concern etched on her face. “Did you hear about Betty Brown? She went into a care home. Apparently it was a great relief for her family,” Brian said. In The Second Coming, Grant Leishman has delivered a highly entertaining and thought-provoking story of hope for a united and peaceful world, told in a light-hearted an very humorous way. There are heart warming moments which brought a tear to my eye on more than one occasion. The chemistry between the two main characters, JC and Ma is electrifying! And, the strength of faith and unity between this group of very loveable characters shines through from beginning to end. This is the first of many great reads from Mr Leishman, I think! 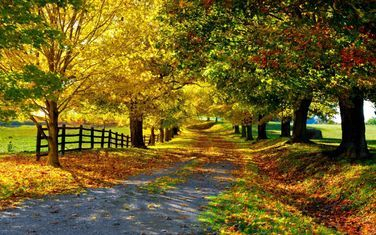 I feel blessed to live in my house in the country, surrounded by green fields, fresh air and wildlife. A mouth-watering aroma of char-grilled meat reaches my nose, making my mouth water. As a drop of rain blots a random word on the writing book on my lap, I can only hope my barbequed food reaches my belly before the storm reaches my house. A familiar call sounds from the trees at the bottom of our garden, in response to my husband’s ‘special’ whistle. And, there he is, whistling right back! There can be no mistaking the damaged and ruffled tail, the scruffy belly and the amicable disposition of the young magpie. We watch in awe as he soars from tree to shrub before touching down on the footpath beside out kitchen door. Peering around tentatively he observes his surroundings, considers the familiar sights and sounds – and off he flies once again, back to his friend who watches and waits, in the red tree beside our gate. Days earlier my husband, Paul and I were driving home. About half a mile away from our house, one of our neighbours was having building work done. We pulled over to allow one of their heavy trucks to pass and it was then we saw the little bird lying on the side of the road in the mud. Paul got out the car to check him out. He was alive but couldn’t move at all. Left there on the road his fate would be sealed, so my husband drove the rest of the way home holding the little bird in one hand while I kept our over-excited little dogs, Peppy and Scrumpy away from him. We didn’t expect him to survive the night so made him as comfortable as we could in a makeshift nest inside an unused glass jewellery cabinet inside our barn, safe from predators. The next two days were spent getting him to take fluids and eat some bread. My husband even tried and failed (to my immense relief) to find worms in the garden. He’d have time in the house and would happy go from person to person, sitting on our hands while being stroked. 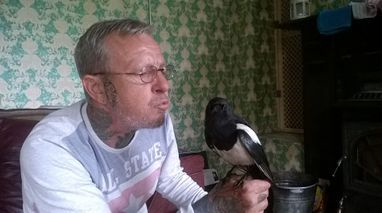 My husband developed a ‘special’ whistle which the little magpie would respond to immediately. Each day he went from strength to strength and started to walk and eventually fly. On Sunday morning we knew he was ready to go back out into the world. It was with heavy hearts we set our little friend free and watched him take his first tentative flight before landing in the long grass. His second attempt was perfection as he glided off over the trees of our garden and vanished from view. All we could hope was that he’d be safe and hopefully be reunited with his family. 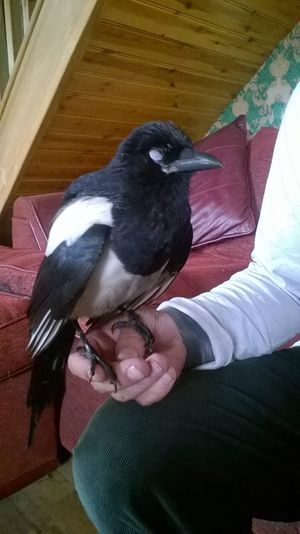 That night I dreamed of our little magpie building a cosy nest in a tree close to our home. A flash of lightening illuminates the ever-darkening sky and the heavens open. We scramble to the barbeque to throw the burnt offerings onto our plates and run towards the house. My husband hesitates before doing the ‘special’ whistle. The baby magpie whistles in return before soaring off, with his companion, to his family down the road. I’m enveloped by a warm glow as I think of how one little act of kindness helped to make the world a better place for a helpless baby animal. Please drop by my Goodreads author page where you can learn more about my books. Thank you for stopping by my blog. Today I'd like to share my true short story with you. I hope you'll enjoy it. Please let me know if you do. Now let me tell you about my eighteen-year-old miracle! Time stood still as we walked through the countryside park. The hazy sunshine struggled to find its way through the misty air and grey clouds. All around us was the sound of birds singing, and feet crunching on gravel. We were passing time while waiting to collect my pregnancy test results from the doctor. Our two small boys were wrapped up warm in winter coats, their cheeks pink and cool in the spring air. Drops of rain still glistened on the green leaves of the trees, and an earthy scent hung heavily in the air. “Look at all the frogs, Dad,” shouted little Paul. All around us were tiny frogs crossing the path to reach the freedom of the lake on the other side. The light shone on the rippling water and ducks buried their heads under the surface looking for food. We bundled the boys into our old blue mini and drove to the phone box near our house. I stepped inside and began dialling the number. Over the road, I could see the eager faces through the steamy car windows, waiting for news. It was the news I was praying for. I was pregnant! We drove home and pulled into the driveway of our two bedroom semi-detached house. Upstairs at the bedroom window, Jasper the cat’s marmalade face peered down at us from behind the curtain. We all went inside. Our living room was familiar and welcoming, with toys and books in the corner and daylight bursting through the French doors. Outside, washing hung listlessly in the still air, and a pan of home-made soup bubbled away on the hob. It felt good to be home. I had sadly suffered a miscarriage the previous year, when I was three months pregnant. We had been trying to get pregnant for around seven months and the baby, like our two little boys was very loved and wanted. I'd had stomach cramps all weekend, so we went to the hospital but there was nothing they could do. Our little baby wasn’t meant to be. We decided to try again, but were unsuccessful. I had to endure fertility drugs, regular blood samples and numerous visits to the hospital for tests. We decided to accept his advice, which seemed so final, and try to forget about babies. After all we still had our precious little Paul and Joe. We would concentrate only on them now. Once home, after getting my positive result, I curled up on the settee with a cup of tea and sat for a while thinking about how lucky I was. I was six weeks pregnant and I was determined to hold on to this little baby, so I spent the next three months trying to do as little as possible. I read loads of books and did nothing too strenuous. By the time I was four months pregnant I felt fine and the scan at the hospital showed that I was having a little boy. When I saw how happy he looked, kicking his tiny legs, I knew he was strong and healthy. It’s hard to believe that someone so tiny can have little arms, legs, fingers and toes. The rest of my pregnancy went well and I enjoyed every minute of feeling the baby moving inside me and kicking when his favourite songs came on Top of The Pops. He especially liked Oasis, just like his mammy. He had good taste in music. Feet and elbows would stick out of my growing stomach, as if he was dancing in there. I woke around 7.15 one morning. The baby’s crib lay beside our bed, all made up with tiny soft clothes folded neatly on the bottom. The baby was now a week late. Downstairs the living room was warm and cosy. The Christmas decorations had been put up a few days earlier in an attempt to lure the baby out. The coloured lights on the Christmas tree glowed brightly in cheerful colours and the metallic decorations sparkled. My little Paul and Joe were excitedly waiting for Santa coming, as well as their new brother. They were on their best behaviour. My labour pains started around half an hour after waking up. I ran a bath and decided to make the bed ready for my home birth while my husband, Paul phoned the midwife. We thought there was plenty of time; after all, things had only just started to happen. Robbie’s big brother, Joe had been born at home very suddenly, but that was a long time ago, we didn’t think it would happen again. The smell of toast rose upstairs as the boys had breakfast and got ready for school. I could hear their excited voices as they awaited the arrival of their new baby. I got into the bath but almost immediately the pain increased and became unbearable. A feeling of fear and excitement surged through me as I tried to climb onto the safety of the bed, hardly able to move or breathe. I screamed for Paul who ran upstairs. Only half an hour since the first twinges and now I could feel the baby pushing his way out. There was no stopping him now and we were on our own. The pain was unbearable! I was terrified! The boys stood at the bedroom door, worried. Paul tried to keep me calm and within minutes little Robbie was born. Paul lifted the baby onto my stomach and wrapped him up. Tiny little hands and feet peeped out from under the soft towel. He looked healthy and pink and completely unaware of all the chaos. I was in shock, so was Paul. We had done it on our own. My husband had delivered the baby (with a little help from me). Eventually the midwife arrived and said she was stuck in traffic and hadn’t expected the baby to arrive so quickly (that’s what the ambulance man said as he delivered Joe on the settee). She examined him and said that he was perfectly healthy. He weighed seven pounds and eight ounces, the same weight as Joe when he was born. When the drama was over, little Paul and Joe came in to give their new brother a kiss and cuddle. They were happy that little Robbie and me were all right. Paul’s mam came rushing straight over to our house to see the new arrival and then she took the boys to school. Little Paul and Joe took great pleasure in telling everyone that they had a new baby brother and that they ‘seen him born’. I looked out of the bedroom window opposite me. It was a cold, dark December morning. I was warm and cosy, feeding my baby in the comforting glow of the bedside lamp. As I looked down at him a feeling of happiness and overwhelming love enveloped me. We had made three little boys. Our little Robbie was well worth waiting for. I sometimes used to think of how something could have gone wrong, giving birth in those circumstances, but it didn’t and everything turned out well. Now I only look back at that time with very happy memories. If I could go back, I wouldn’t change a thing. I would do it all again. For today's blog post I'm taking you back to Serena, one of the main characters in my book, Soup. Serena, like myself loves to dabble in aromatherapy and making natural skin products. I told her all about my magical plants. Let me tell you too. One summer while visiting a friend she very kindly gave me a cutting off one of her plants which was hiding on top of her kitchen units. I nurtured my little Aloe Vera plant and brought it to life with a vengeance. Now, around three years later I am inundated with Aloe Vera plants which just keep on growing. When people visit me, I send them away with their very own plant only on condition that they promise to provide my offspring with a good home and make use of its precious gel. Aloe Vera gel is loaded with vitamins and minerals and has excellent healing qualities. And, because of its high water content it’s great for hydrating and moisturising the skin. It has emollient properties which soften and smooth the skin as well as improving its elasticity. Aloe Vera gel is also known to reduce inflammation and can help to soothe stiff and painful joints. Spots, minor cuts, burns or scalds, insect bites, nettle stings, eczema, psoriasis, cold sores, brand new tattoos, to name but a few. I also like to use the gel from my Aloe Vera plants as a natural beauty product. Let me tell you how I prepare it! Choose a fleshy leaf from the bottom of the plant, these are the most mature and have the most goodness. Remove the leaf close to base taking care not to damage the plant or cut yourself! Fillet the leaf by cutting down one side to the other then open it out so the gel side is facing up. Apply directly to skin or…do as I like to do by following the steps below to make a nourishing natural skin product. Use a teaspoon to scoop out the fleshy gel (it’s very slimy!) and place in an egg cup. Use another leaf or two if necessary. Add the contents of one evening primrose capsule and four drops of essential oil. My favourites are neroli and lavender for their all-round goodness, skin generating properties and kindness to mature skin. Use either four drops of one type of oil, or two drops of both. With a fork try to mash it up a bit. Cover and store in the fridge and it will keep for around three days. Massage into the skin of your body and face, avoiding eyes. Voila! You are a natural beauty and you smell divine. As is the case with essential oils Aloe Vera gel is very potent. For best effect don’t use any such potion continually for more than seven days. I consider it a special treat which I enjoy now and again. Also, I am a mere complementary therapist not a doctor! If you have any concerns about your health or about using Aloe Vera gel or essential oils please check with your doctor first! So, here I sit, munching on warm cheese scones, supping tea and doing everything but what I’m meant to be doing. I sit down at my desk intending to get stuck into some writing, open my notebook and write a paragraph or two. My computer screen stares blankly at me, urging me to switch it on. My fingers wander around the keyboard and hesitate over the ‘on’ button. It’s no good! Resistance is futile. Before I know it the music is on and I’m negotiating my way between Twitter, Facebook, Goodreads and my email accounts. Then…I feel the grumbling and remember that to have the strength to work I need to eat something nice and drink more tea. After all, a happy belly equals a happy mind. Once I’m fortified I can no longer ignore the hideously blank page which begs me, Crack on, woman! This book won’t write itself. It takes all my strength to drag myself away from the computer and resume my work. Not too long ago I was much more disciplined. After the morning school run I’d go straight to my desk where I’d remain until I’d completed a substantial amount of work. There would be no computer, no music, no Kindle and no cheese scones and tea until I had earned the privilege. So, what went wrong? Trying to get over a never-ending virus was a big factor. Maybe I need to dump my computer into the nearest wheelie bin and learn to embrace my grumbling belly. Or, maybe I need to go back to basics and give myself a good kick where the sun don’t shine. Well, is it just me? Sitting beside the blazing fire, watching snowflakes dance past the window, the clicking of my knitting needles is the only sound to break the tranquillity. 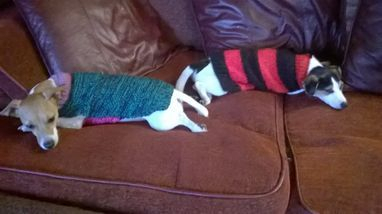 I sigh with contentment as I look at my two little doggies, wrapped up warm in woolly jumpers and sleeping peacefully. No, don’t stop reading yet! If you’ve read my latest book, Soup, you will remember Serena, who loves to dabble in aromatherapy and hand-made skin products. I taught her everything I know, being the qualified complementary therapist that I am. You will also be aware that Serena is passionate about her pooch. Toby is never without a new jumper, thanks to me of course. It was me who gave Serena the pattern! 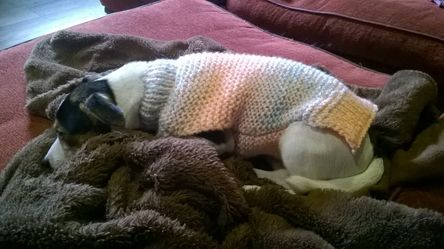 So, doggie-loving knitters, let me share with you a very simple pattern to knit a cosy jumper for your pampered pooch. 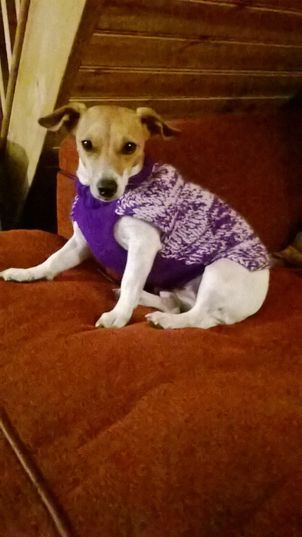 This is the pattern I use for my girls, Pepper (the foxy lady) and Scrumpy (the patchwork pup) who are both small Jack Russell terriers. My measurements are a rough guide. If you’re clever, you can adjust things for a slightly smaller or larger doggie by adding or reducing a few stitches when casting on the back panel. You can also knit the length to suit. If you’re more adventurous than me you can use different patterns or colours in the main body. I stick to plain. 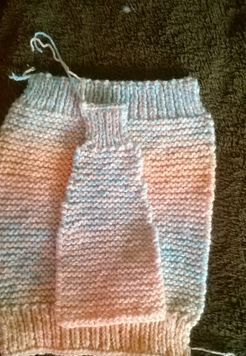 Change to 6mm needles and knit until total length is approx. 30cm. Knit for approx. 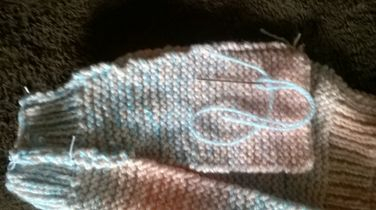 12cm then cast off 1 stitch at each side. 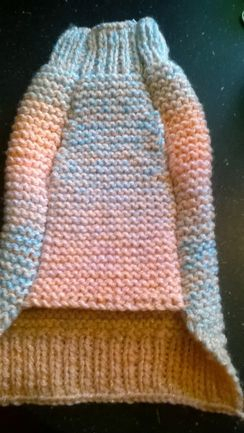 Knit 10 rows. Cast off 1 stitch at each side of row 10. Working on the ‘wrong’ side, use a darning needle to thread the thin elastic through the top and bottom of the neck rib on the back panel. Take care not to make it tight. It’s only to hold the rib in shape. Tie securely at each end. 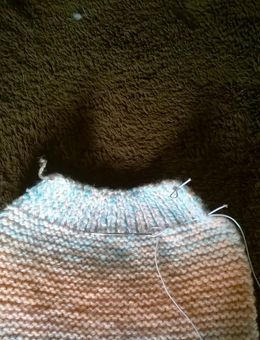 Using thin wool and a darning needle, right sides together, stitch from top of neck rib to approx. 1 and ½ inches below it. Leave approx. 10cm for arm hole then stitch to bottom taking care to keep the bottom parts even. Trim off all loose ends and turn right way. As they year draws to a close I find myself thinking about what I’ve achieved/not achieved in the writing world. When I first started using Twitter (when my first book was published) it terrified me. I had no idea what it was all about or what I had to do with it. Now I see it as a great community of writers, with lots of familiar faces. There is also lots of friendly interaction. During those long stints of editing or typing I know I’m part of a group of people who are doing the same as me. I have slowly built up almost 1,000 followers, which is great! I hope to see that number grow next year. Thank you to all my followers. I’m really happy with the number of visitors to my author blog. I have written sixteen blog posts in total. Thank you to everyone who took the time to visit (I hope I didn’t bore you too much), and I hope you’ll continue to read my posts next year. I have built up 426 friends and gained six fans. Yay! I’ve read loads of books and reviewed thirteen. Recently I joined the Beezeebooks community, run by Mike Smith, who works really haard to promote the work of indie authors. I also recently set up a website (not very good) and hope to improve on it next year. Thank you to everyone who has visited me there. It’s just fabulous when a best-selling author sends me a friend request on face book! I was really disappointed that my new book, Soup didn’t make it out in time for Christmas as I’d hoped. It will be the New Year now, along with my next book, A Little Bit of Me. I’ve spent the last few months editing: my two new books which are due out. I am currently editing a project which I hope to be ready for the publisher in the New Year. It’s in two parts and will be under a pen name. The second part I hope to have ready for the summer. Spending so much time editing is no fun. I’m eager to finish this project so I can get on with some actual writing in the New Year. I have three novellas in mind. I don’t know if they will materialise but I will do my best to make it happen. I will also continue to work hard to get my name and my work out there, and hope that some readers will hunt out and enjoy reading my books. While so many people are looking forward to a Christmas surrounded by family, friends and gifts, others are facing a bleak festive season. In these hard times there are families who can’t guarantee a Christmas dinner for their children let alone new toys and clothes. Some people will be spending the festive season alone, sleeping rough on the streets, or far away from their loved ones (like someone I love). My wish is that everyone has a safe and peaceful Christmas and a positive New Year full of new opportunities. With my new book, Soup due out soon I’d like to give you a short description of it here. When Serena stumbles across the scene of a suicide one blustery autumn morning on the beach at Devil’s Cove, the experience brings some deep feelings bubbling to the surface. Only closure on a certain situation will allow her to move on with her life, and fulfil her dream of finding true love. Her destiny could be just within reach. Ava’s been papering over the cracks in her marriage for too long. 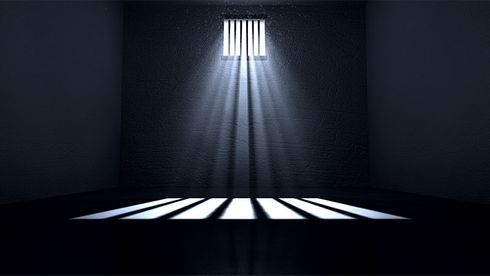 The luxury apartment her husband, Richard calls home is feeling more like a prison every day. 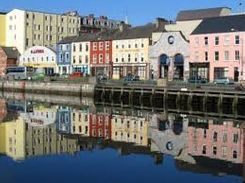 She craves the laid back, seaside lifestyle of Harbour View and Devil’s Cove, far away from the chaos of Cork City. Each time she witnesses yet another homeless person hungry and cold on the city streets Ava’s heart bleeds. She always does what she can to help ease their suffering but feels there must be more she can do. She’s always had an overwhelming urge to help people less fortunate than herself but Richard has a very different opinion on that subject. When at last she gathers the courage to volunteer at The Central Soup Kitchen on Christmas day, Ava realises she’s found her vocation and gains so much more than just job satisfaction. Two kindred spirits lost and alone – so close and yet so far – two pairs of identical eyes, scarred with pain and searching for answers. Unbeknown to one another they’ve already crossed paths. But a web of secrets and lies has the potential to destroy their union before it even has a chance to begin. Serena’s spell book is her most precious possession, handed down through the generations of women in her family. There’s more than home cooking taking place behind the door of The Book Nook. Serena enjoys adding a scoop of sorcery to her recipes. But do the benefactors of Serena’s spells have enough faith for them to be of any use? Sometimes it seems like she’s the only person who believes in the power of magic. One day she gets a little mixed up with her potions but can she really brush it under the carpet and hope no one will notice? Only time will tell. For news on its release please connect with me on face book and Twitter. With the issue of homelessness at the heart of my book I’d like to tell you a little about the homeless crisis in Ireland. Shopping trips in bustling Cork city used to be a regular thing in the days when myself and my husband had a thriving business there. Like so many others though, we lost our business to the recession in 2012. Trips to the city are rare now, and usually entail a stroll around window shopping and a cheap bite of lunch. One thing that remains the same, if not worse, is the number of homeless people sitting on bridges and outside busy shops, holding out a cup in the hope of some spare change from passers-by. We may have lost our business but we still have a roof over our head, even if there’s no knowing for how long. More and more families are finding themselves homeless in this era of unemployment, negative equity and house repossessions. Recently I signed The Simon Community’s petition aimed at the Irish government and calling for them to act on the homeless crisis which only continues to get worse. 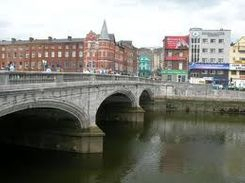 Please click on the link to learn about the work of the Simon Community in Cork. Thank you for visiting my blog. I hope you enjoyed it. Please feel free to leave a comment.